I was talking with a friend of mine who's a vegetarian. She said it would be so hard for her to follow a diet like this since soy and dairy are her major sources of protein. And she's right, it would be very difficult. But there are options. 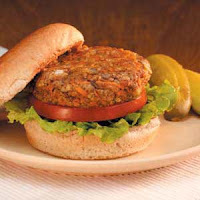 Most commercially prepared veggie burgers have soy in them, but this recipe from Taste of Home uses chickpeas. Just make sure your buns are MSPI-friendly.